The Supreme Court ruled on Tuesday said that Monsanto can claim patents on its genetically modified (GM) cotton seeds, a victory for the US company that is expected to encourage biotechnology firms to step up investment in India. So Monsanto has dodged the bullet — for now. The European Union has just voted to relicense the controversial herbicide glyphosate — marketed as Roundup — for another five years. That’s far less than the 15 years initially sought, but much better than the total immediate ban sought by some countries and legions of vocal environmental activists. A new variety of genetically modified cotton is shaping up to be a game-changer for those looking to grow cotton in northern Australia. 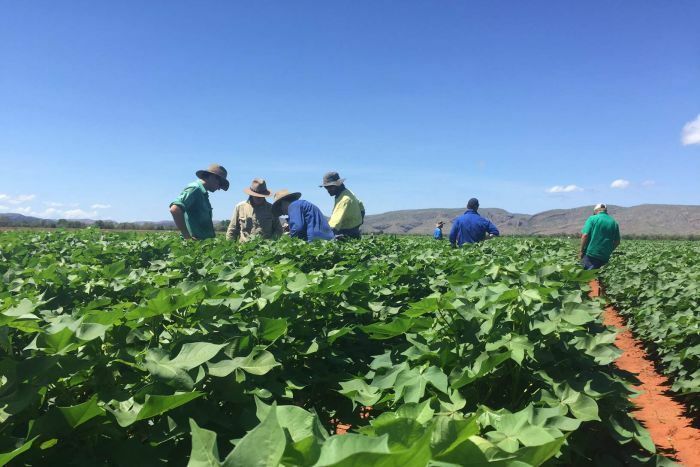 Monsanto’s new Bollgard 3 is currently being trialled on a farm in the Kimberley’s Ord Irrigation Scheme in far north Western Australia. It was planted in early February during the wet season and is showing positive signs of being resistant to insects, especially when compared to the Bollgard 2 and conventional cotton varieties that have also been planted in the trial. CSIRO researcher Stephen Yeates said the cotton industry may have finally found a plant that could withstand the insect pressures of northern Australia’s wet season. “The Bollgard 3 has an additional gene, which will control a key wet season pest called spodoptera,” he told ABC Rural. “The additional gene is the only difference [to Bollgard 2]. They’re identical in every other way. Dr Yeates said the Bollgard 3 plants at this stage were growing the same as Bollgard 2, but the increased resistance to insects was noticeable. The Ord trial is expected to be harvested in June. It is not just the Ord Valley showing an interest in cotton, with farmers in the Burdekin and Gulf regions of Queensland also looking into cotton opportunities. Dr Yeates said the introduction of Bollgard 3 gave farmers in northern Australia the opportunity to plant during the wet season, which had a number of advantages. “The idea is to plant later in the wet season, from late January onwards, so that the early growth of the cotton is during the wet weather, and then you get the boll filling during that critical stage where you need reliable sunlight, in that April, May period if you plant early,” he said. “So you plant in the second half of the wet, you probably don’t need to irrigate [initially], then finish the crop with irrigation and harvest in June. However, Mr Yeates said planting in the wet season also presented challenges, and accessing paddocks would be difficult in some years. The current plan in the Ord Valley, being driven mostly by the company Kimberley Agricultural Investment (KAI), is to develop more of the region’s sandier, well-draining soils, which would improve the chances of being able to access land during the wet season to plant cotton. KAI general manager Jim Engelke said the company was willing to invest in a cotton processing plant, but it would need about 10,000 hectares of cotton a year to make it viable. Cotton growers in southern Queensland and New South Wales are growing Bollgard 3 commercially for the first time this year. Andrew Sevil, from Whyenbah near St George, said despite a bad run of weather in his region, the cotton had performed well. “From my perspective it hasn’t been too different, but I guess we won’t know until we get the cotton into the gin to see what the end result is,” he said. Mr Sevil said the new cotton had shown good resistance to the pest heliothis, and he was hopeful of getting 12 bales a hectare. On its website, Monsanto describes Bollgard 3 as a “major milestone for innovation in cotton”. “Having three proteins (genes) will increase the longevity of the technology as each protein has a different mode of action, which means each protein kills larvae in a different way,” it said. -Written by Matt Brann in ABC News. See original article link here. NEW DELHI: Global biotechnology firms are positive about India’s robust regulatory regime for approving genetically modified crops, which has started functioning transparently and effectively in recent months after years of lethargy , though concerns over Monsanto’s woes linger, top executives representing international companies said. The key change in the regulatory approach is in the regular meetings of the apex approval body, the Genetic Engineering Appraisal Committee (GEAC), which is now meeting every month, ending its inactive phase when the panel didn’t meet for long periods, at times for a year, executives said. “Process at the central level has improved a lot since last few months,” said Shivendra Bajaj, executive director of Association of Biotech-led Enterprises, Agriculture-focus Group (ABLE-AG). “Now, GEAC is happening on a regular basis (and) has been very transparent. They have been doing the right thing now. I think the present position of the (Central) government with regard to science is encouraging.” ABLE-AG counts Bayer, Monsanto, Syngentaand Dow Agrsciences among its members. As the dispute between the biotechnology companies and indigenous seed manufacturers over patent rights lingers, the favourable assessment of a key committee formed under the GEAC with regard to genetically-modified (GM) mustard or ‘DMH-11’ has invigora ted biotechnology providers about the prospects of investing in India. The process of approval for transgenic crops includes biosafety committees, review committees, monitoring and evaluation committees for field trials, and the GEAC, following which the environment ministry needs to sign off for commercialisation of GM crops. Case in point is the moratorium on Bt brinjal despite GEAC clearance.Further, states have the option of refusing to allow field trials or deployment of GM crops despite regulatory approvals. And this is where, according to the biotech firms, maximum reform needs to take place. “There is a process of NOC before you. Certain states have come on record who refuse (to give an NOC). So, even if GEAC approves, the state government is a major challenge for us,” said Bajaj. -Published in The Economic Times. See article link here. Monsanto Philippines, together with the University of the Philippines League of Agricultural Biotechnology Students (UP-LABS), recently led a student outreach activity in Muntinlupa City to broaden young people’s awareness on the role of modern agriculture in feeding the country’s growing population. UP-LABS members performed an on-stage adaptation of the published children’s book Lina’s Town Rises Again, inspired by the tale of triumph of a lady corn farmer in Sultan Kudarat. Almost 50 grade school students and teachers from the Alabang Elementary School watched the live performance at the Bulwagang Haribon, Insular Life Corporate Centre in Muntinlupa City. Monsanto Corporate Engagement Lead Charina Garrido-Ocampo shared that the activity was meant to help young students gain a basic understanding of the food value chain, the different challenges to food sufficiency, and the role of modern science in keeping up to the growing demand for food. She also highlighted the importance of engaging the next generation for the future of agriculture. “Today’s youth plays a critical role in contributing creative ideas and actions to address real-world issues such as food security. Monsanto’s collaboration with UP-LABS demonstrates our efforts to work with different stakeholder, including the young, to promote sustainable agriculture,” Ocampo said. Meanwhile, UP-LABS President Jakov Abellido hopes that the activity will be able to correct the stereotypes surrounding agriculture as a low-income and “uncool” profession, and in turn, attract them to take agricultural science. “Currently, the image of agriculture among the younger population remains ‘uncool’. Rapid urbanization and rural-urban migration continue to become major factors causing the disinterest in agriculture among young people. Because of this declining interest, reaching out and educating them is a key step in ensuring our youth’s continued involvement in the farming sector,” Abellido said. Monsanto is committed to expanding the discussion on the importance of sustainable agriculture in schools and colleges across the country. Since 2012, Monsanto has already reached out to more than 10,000 students in Quezon City, Iloilo, Davao, General Santos and Cagayan through their activities geared towards making young minds interested in agriculture. -Published in The Standard. See article link here.